There was a time when a company meeting entailed a lengthy round-table conversation, with coffee and donuts scattered about. While the goodies may remain, the advent of tablets, smart phones and interactive wall screens, has lessened the need for those sit-downs—or at least created the means for supplementing them. Yet, all the devices enabling this paradigm shift need support, too, and that’s the territory of a company that has long sought to improve the efficiency and aesthetics of how we plug in. Based in Woodland, New Jersey, FSR Inc. designs and manufactures floor, ceiling, wall and table boxes; power and cable products; distribution amplifiers; interfaces; mounting solutions; video switchers and many other products that facilitate the use of audiovisual and IT infrastructure in work and school settings. FSR has been in what you might call a “tech support” role since it opened its doors in 1982, and while Melchin is quick to point out the challenges of keeping with the times, he’ll also note something that’s distinctly practical: How things look. “We know that interior designers and architects want to embrace these technologies, but from an aesthetic standpoint they don’t want to look at any cabling or ugly plugs. Our goal is to seamlessly integrate these connection points into a space so that they are accessible, but essentially hidden from view,” Melchin says. Such was the motivation behind the Huddle VU Collaboration System. 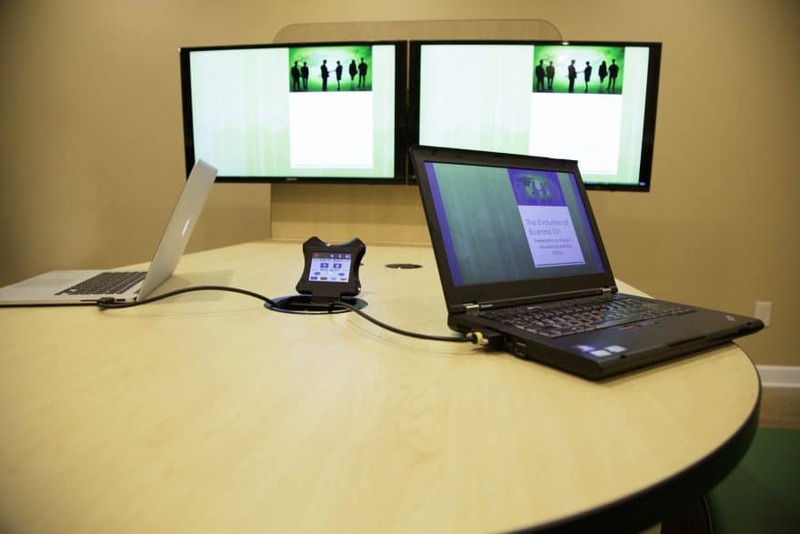 Launched in 2014, the product line consists of conference tables and desks equipped with HDMI cables, including a VGA to HDMI signal converter, and outlets for four to 12 connected devices. This represents the first time FSR had partnered with a furniture maker, and the company reports great feedback from customers across multiple industries. When Melchin spoke to US Builders Review by phone from FSR’s booth at Dallas’ METROCONN, a not-for-profit conference geared towards interior designers, architects, facility managers and real estate professionals, he was busy showing off the company’s latest venture into aesthetically pleasing technology support. “We’ve had fantastic success, especially in higher education, because of how these products support collaboration inside the classroom, and it’s the same for corporate environments. Meetings are condensed to 15 to 20 minutes because of how easy it is for people to ‘huddle’ around our products and share data through their devices,” he says. Yet, even with the success of Huddle VU, Melchin says it’s company policy for FSR never to stop improving. “We’re always listening for new ideas from the field because it’s often how we develop new products that can be a solution for this ‘fill-in-the-blank issue,’” he says. Since the Huddle VU was first released, FSR has gathered feedback from tech managers at universities, AV consultants, designers and electrical engineers, to continually tweak the collaboration system. This information led FSR to develop the Huddle BLOX in 2017. 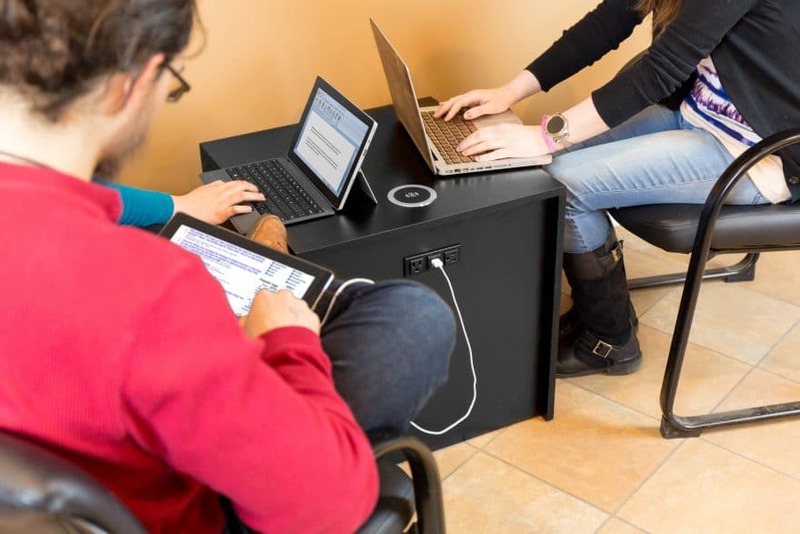 The rectangular box is similar to an end table and has USB and electrical outlets that can charge multiple devices, as well as a wireless charger. Melchin says universities particularly love this “product child” of the Huddle Collaboration System. “We’ve found that this is an excellent solution to transform an underutilized space into a functioning study nook,” he says. 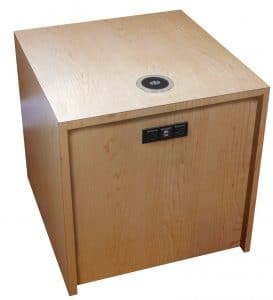 Take a storage room or equipment closet, for instance, and add in a few Huddle BLOXs, some comfy chairs and reading lamps, and suddenly students have a new study room. 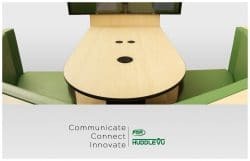 Melchin says that the possibilities for Huddle BLOX, and the rest of the Huddle VU products, aren’t limited to college campuses and office buildings. He’s already had architects tell him that these inconspicuous charging stations would fit well in a hotel lobby, helping busy travelers charge their phones before a long flight. FSR even has ideas to get them into hospitals, allowing doctors and medical professionals to share information from their devices without fear of losing power. “We have a saying in the office that we try to provide solutions from the ground up. Whether it’s the floors, ceiling, walls or furniture, everything is an opportunity to support our customers,” he says.